As improvements in living conditions and advances in modern medicine lead to increased life expectancy and the number of older adults world-wide continues to grow, so the number of older individuals with cardiac and cerebrovascular disease is rising. Over eighty per cent of all cardiovascular disease-related deaths now occur in patients aged sixty five or older. The high prevalence of co-morbidities, frailty and cognitive decline amongst older patients requires that a holistic approach to the management of cardiovascular disease is required. Written and edited by leading experts in the field, ‘Cardiovascular diseases and health in the older patient’ provides scholarly evidence and data which explain why treating an older patient with cardiovascular disease is often different from treating a young or middle-aged patient with the same disease. The chapters have been updated and expanded from the cardiovascular section of the renowned ‘Pathy’s Principles and Practice of Geriatric Medicine’, edited by Alan J. Sinclair, John E. Morley and Bruno Vellas. The revised chapters contain updated evidence and references to recent clinical practice guidelines in Europe and North America, this book provides complete, authoritative information on this major cause of death, poor health and disability in old age. 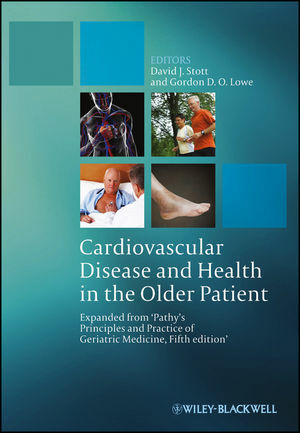 Covering the epidemiology, pathophysiology and management of cardiovascular disease in the older patient, the book is an excellent reference at all clinical and pre-clinical levels and will appeal particularly to geriatricians, cardiologists, and GPs, as well as cardiac specialist nurses and practice nurses. With a Foreword by Stuart M. Cobbe. David Stott is Cargill Professor of Geriatric Medicine at the University of Glasgow. Chair, Health Services Research Committee, CSO, Scottish Executive, from December 2007. Systematic Reviews Editor and Member of the Editorial Board for Age and Ageing, 1998 to present. Subeditor for Geriatric Medicine British Medical Bulletin, August 2004 to present. International Advisor, Asian Journal of Gerontology and Geriatrics, August 2006 to present. Gordon D.O. Lowe is Emeritus Professor (formerly Professor of Vascular Medicine) at the University of Glasgow; Director, Haemostasis and Thrombosis Laboratory and Co-Director, West of Scotland Haemophilia and Thrombosis Centre. He has developed a major research programme including clinical trials, and analyses in epidemiological studies of the contributions of haemostatic, thrombotic and haemorheological factors to vascular diseases.